With the wild winter weather this week, it was encouraging to get a glimpse of spring at this edition of NY Now 2015. 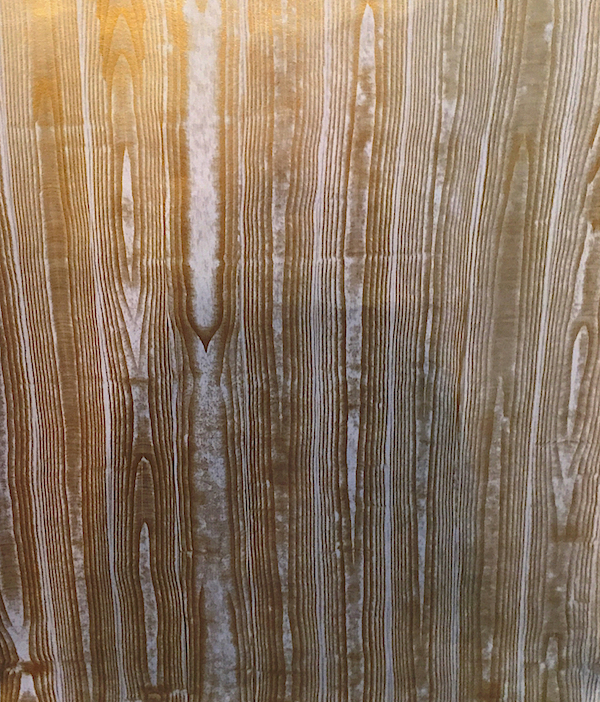 While we looked at the influence of black, white and gold, color was clearly on everyone’s mind. Oscar de la Renta‘s small booth was like a big breath of fresh air. 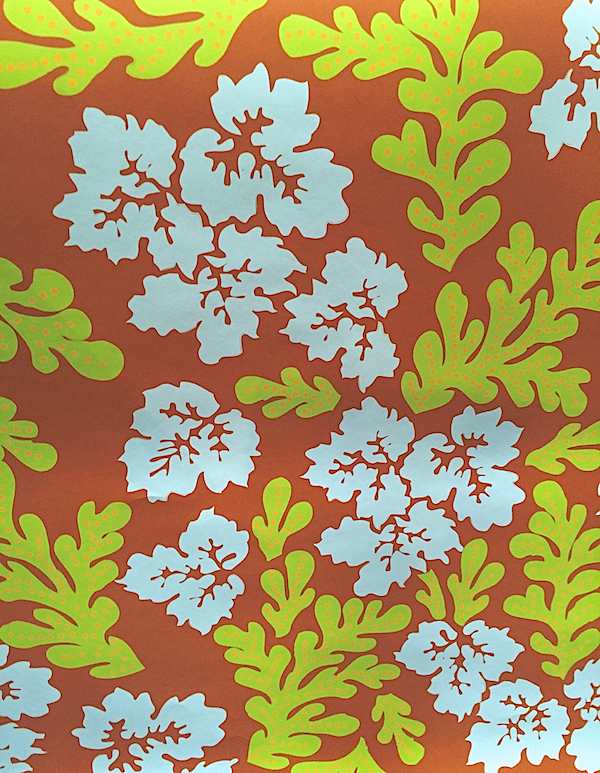 Oscar’s Hedges wallpaper for Lee Jofa was the perfect backdrop for the new spring offerings. 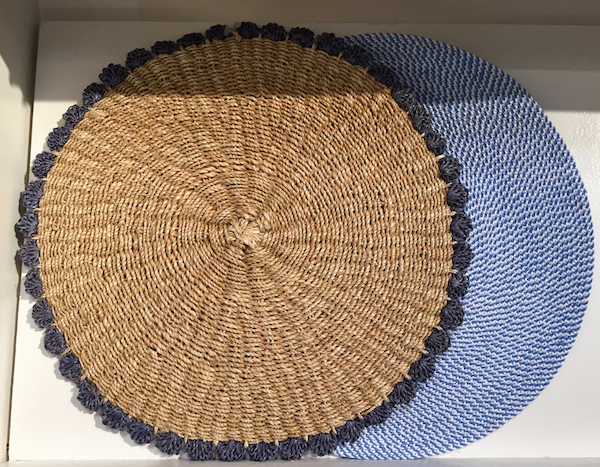 Like Bunny Mellon, it seems the chicest people understand the understated appeal of straw and wicker, including Creative Director Caroline Irving. 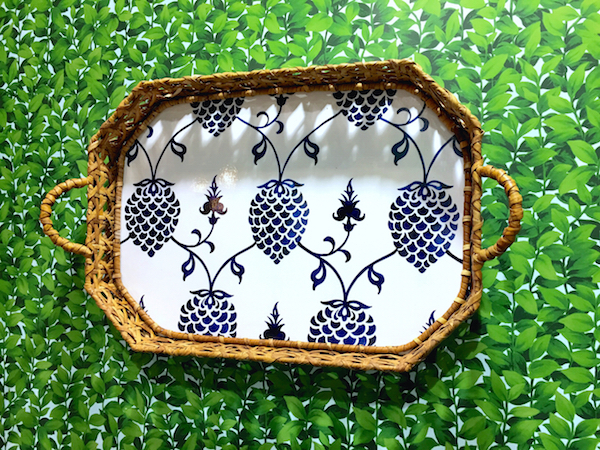 The new tray below with a wipeable resin insert is just oozing with charm. 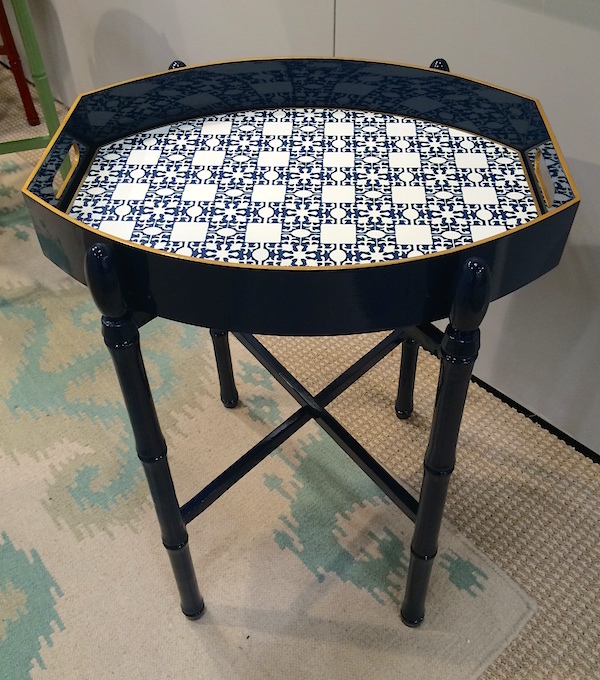 And a larger version on a faux bamboo stand, with insert reminiscent of Portuguese tiles, is an entertaining essential that every home can use. As the days get warm, it can also effortlessly migrate outdoors, weather permitting of course. The rug is a marvelous new design by Carolina for Elson, mixing floral and geometric themes for easy to live with graphic appeal. 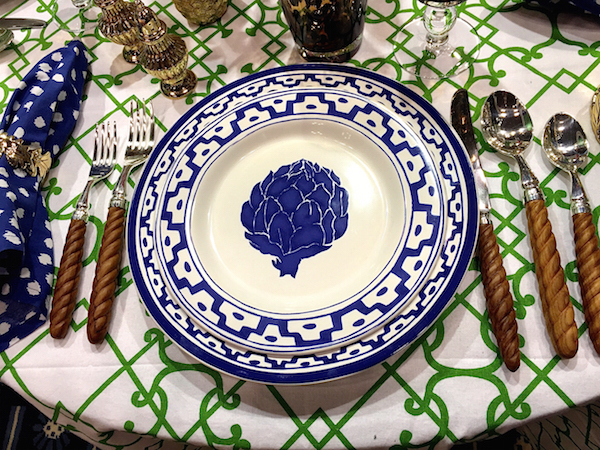 The new artichoke dinnerware, like all the other introductions, has a refreshing global aesthetic. It’s all about the layers and each of these additions works wonderfully with the rest of the line. I’m looking forward to even more additions coming soon. 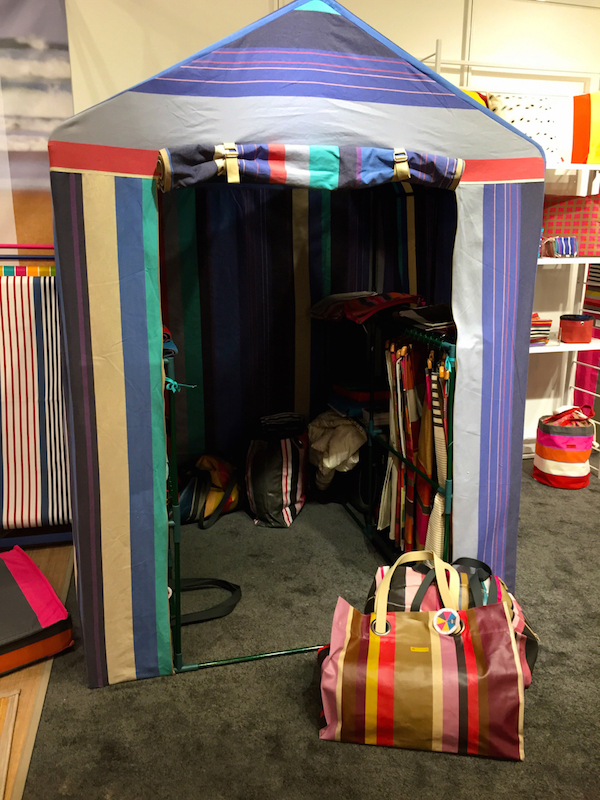 Too bad the colorful tent in Artiga‘s booth was only for display – such a fun idea. 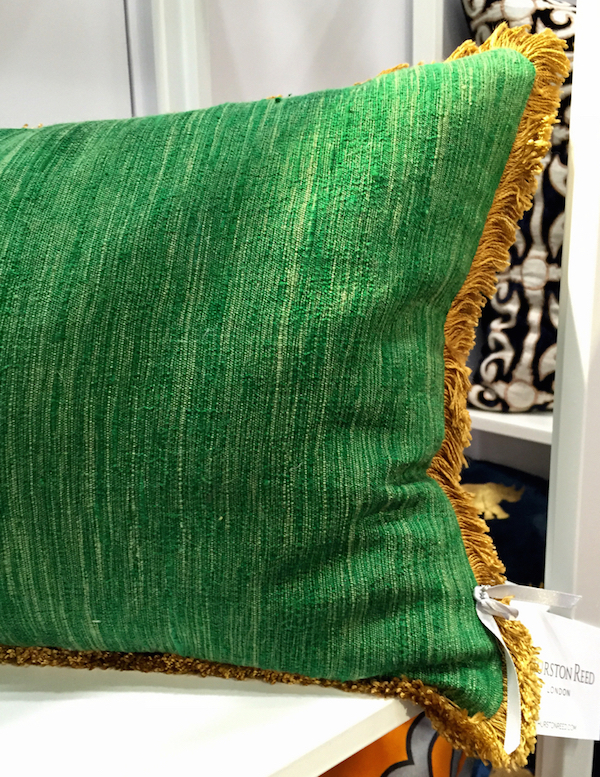 Since 1999, this French fabric company has been continuing the time-honored weaving tradition of Basque linens. 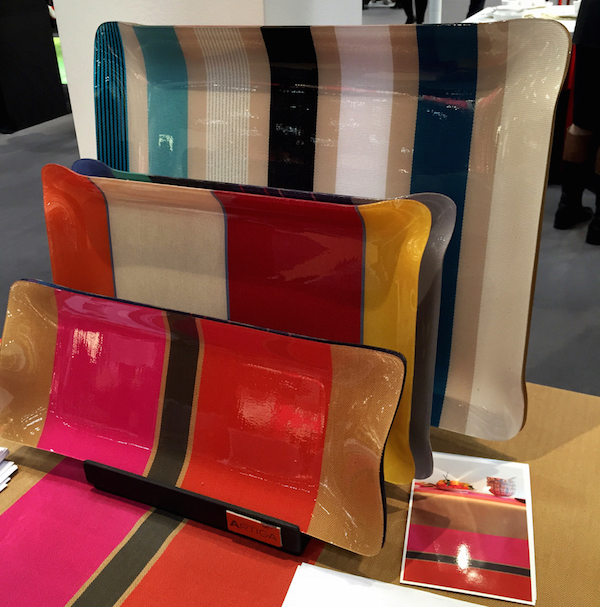 to lovely laminated trays as well as many more products based on the cheerful stripes of their native Magescq. 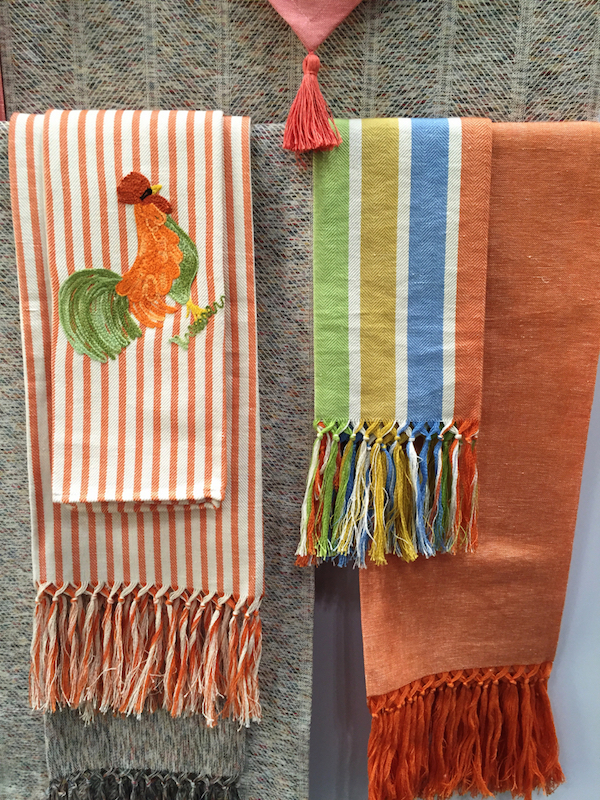 Nantucket based artist Audrey Sterk and her unique line of home furnishings is a regular stop for me. I particularly like her hand drawn wallpapers and murals. This show she featured a beautiful custom color of one of my favorite patterns, Fair Street. 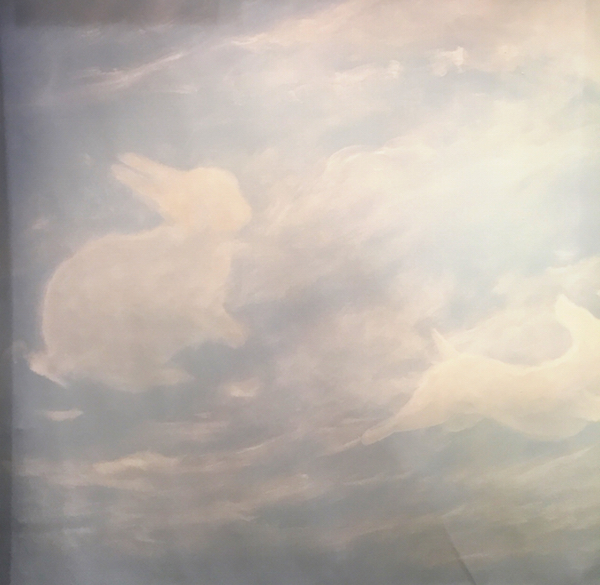 and new murals included ethereal clouds for a children’s room. 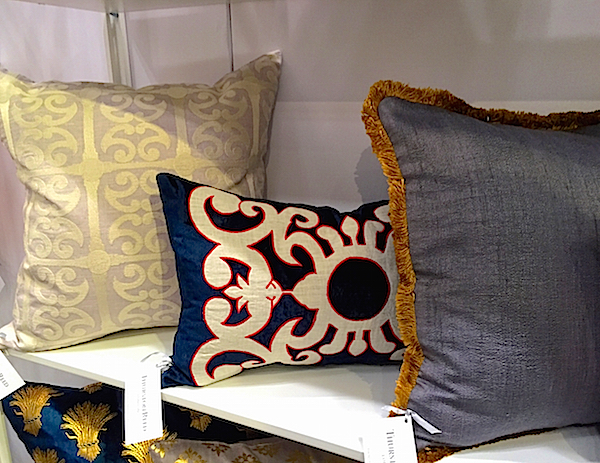 Launching at NY Now 2015 was Thurston Reed, a luxury decorative pillow company inspired by stately British heritage tempered with a contemporary global view. 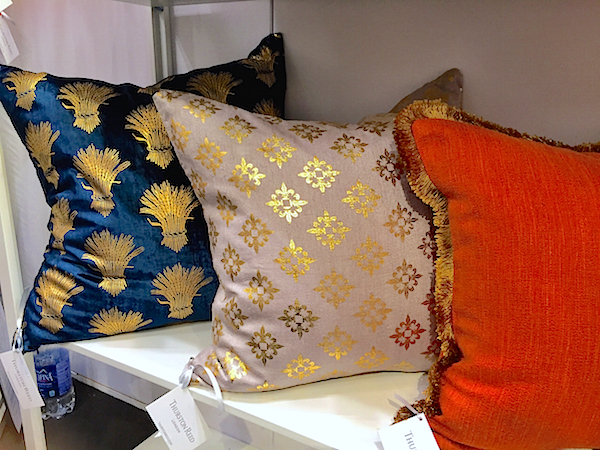 Using hand-dyed silk, velvet, linen and cotton each pillow is hand finished in a small factory in India with artisanal techniques such as antique gold block printing, embroidery and appliqué. Designed by Londoner Nicholas Reed and American Sarah Thurston, the pillows are of ethically sourced materials made in a factory passing environmental compliance, safe working conditions, and fair pay. 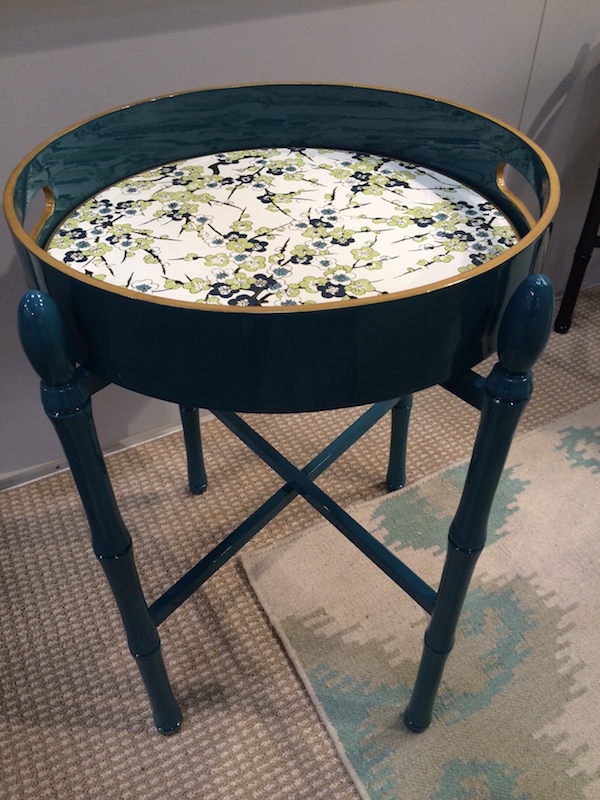 A wonderful addition for the timeless modern home. 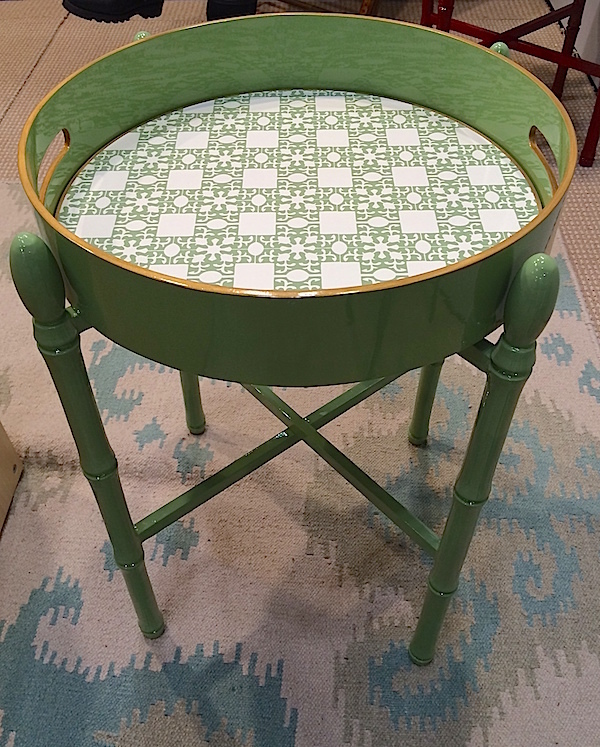 I’ve been following Holly Stuart ever since I discovered her tabletop line at the show several years ago. My favorite new addition is her Stinson Tray Collection. Handcrafted in Vietnam using the traditional multi-step layered lacquer process, the trays are available on their own or with a stand. Holly cleverly configured them to perfectly fit her mats – either round, as above, or elliptical, as seen below. And how easy to change the look with just a new mat. In a rainbow of beautiful colors, there are options for every room in the house. While we looked at Kim Seybert‘s black and white offerings earlier, her strength is really color. 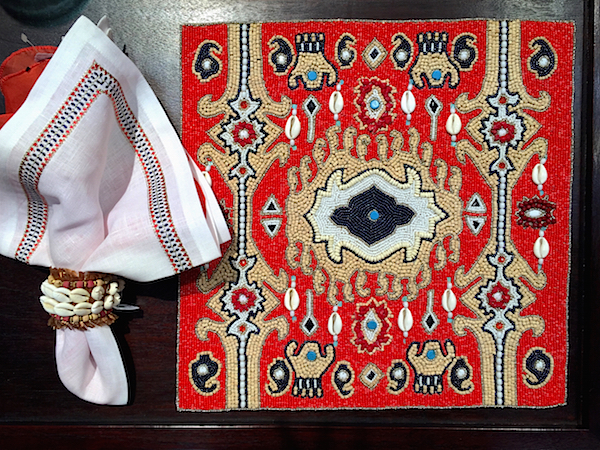 One of her signature looks this season is the Peruvian inspired Nomad collection with fully beaded mat, embroidered napkin and fringed shell napkin ring. 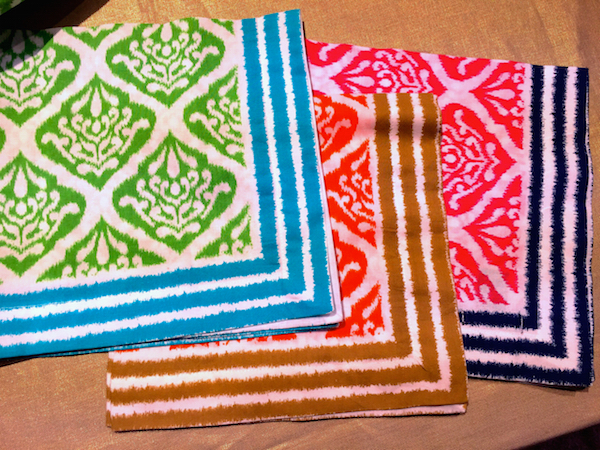 they would also look fun with the new Ethnic Ikat line. Kim’s popular Round Bamboo collection is now extended with a Hexagonal design. 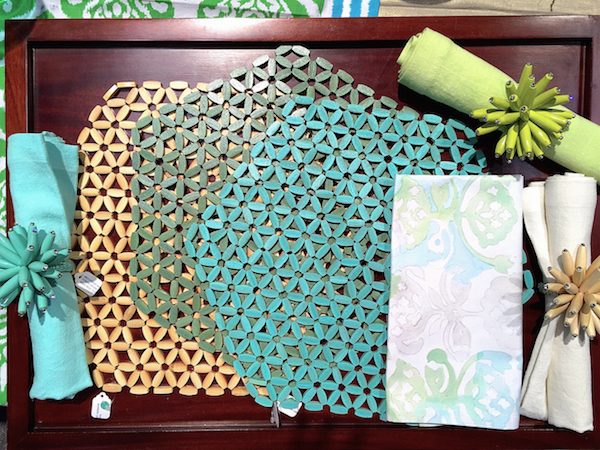 In water inspired pastels, the mats are joined by new wooden Constellation napkin rings and Watercolor napkin. 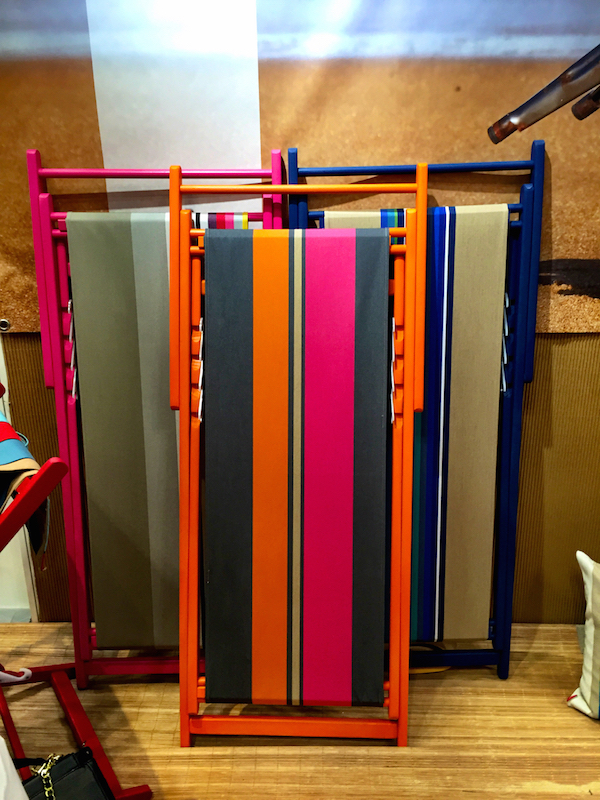 For all the upcoming summer holidays, the Grommet Border mats are a perfect pick. 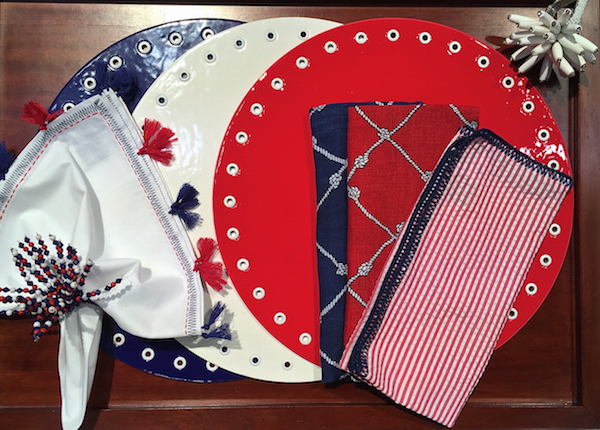 With a wipeable patent-like surface they are child friendly and great for outdoor or on the water entertaining. 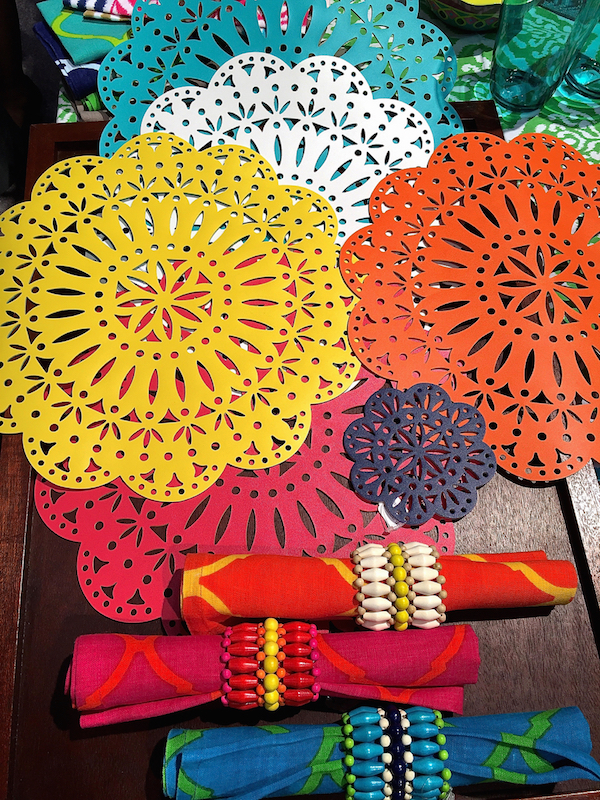 I also love the whimsical details on the Pom Pom napkins. 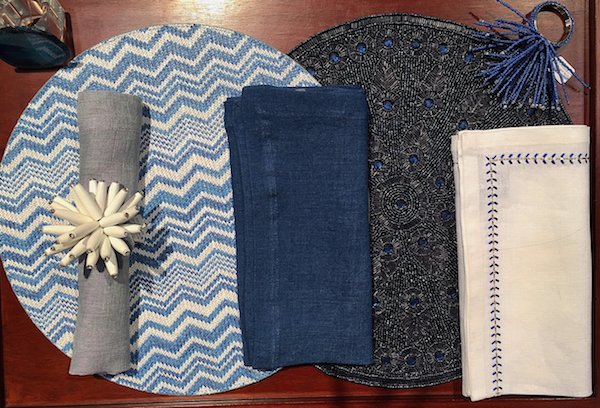 You can’t ever have too much blue for summer and the new Zig Zag blue raffia and PVC placemat shown with the new White Wood Constellation ring also offers practical handsome appeal. 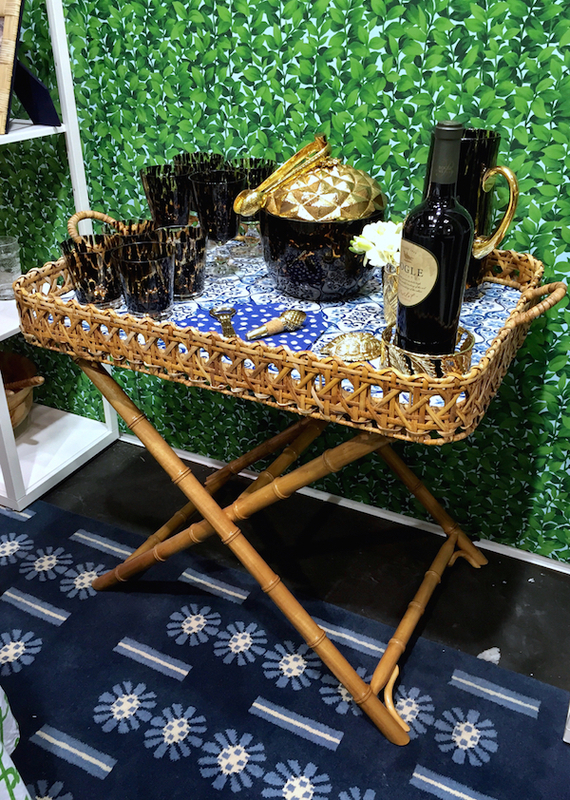 For a little evening bling, the navy beaded Kaleidoscope mat is a good option. 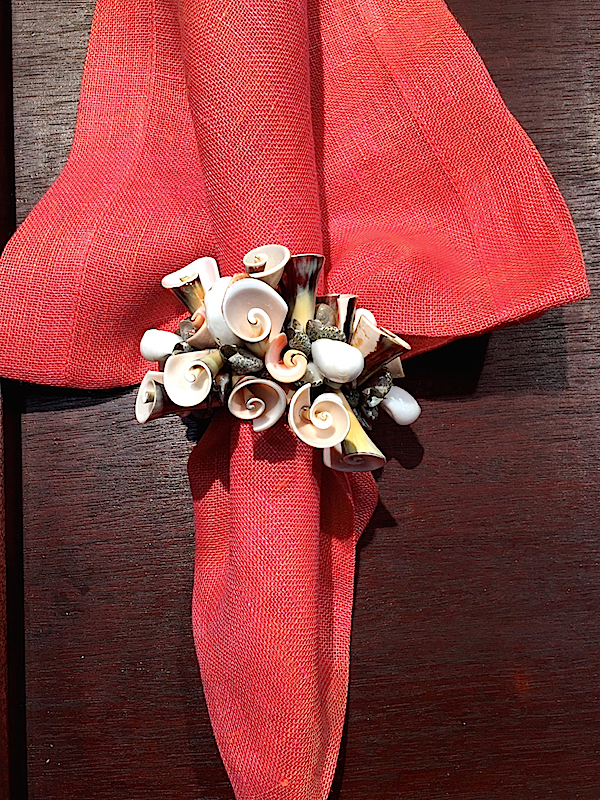 And for casual beach chic, I liked the Curly Shell Napkin ring and Salmon Chambray Gauze napkin. Deborah Rhodes offered alluring options in blue as well. 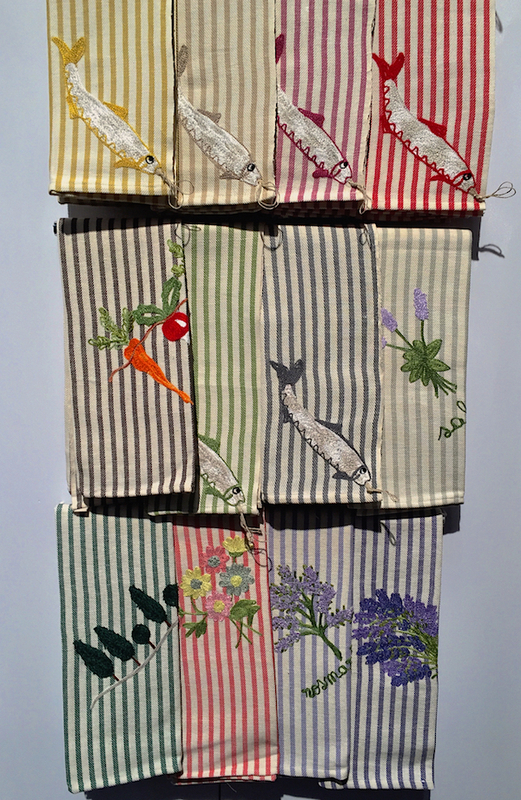 I was totally enchanted by the Italian linens line Busatti. 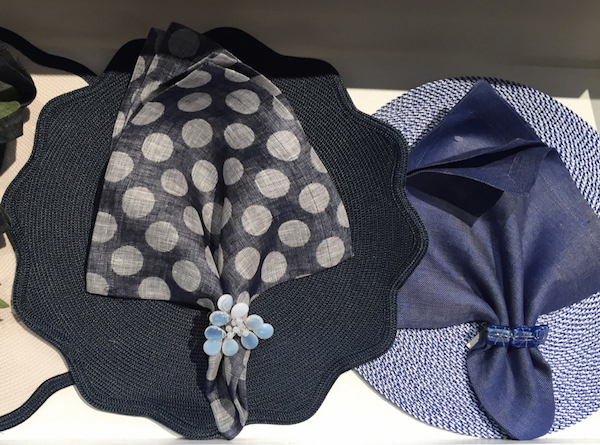 Since 1842 they have been creating handcrafted fabrics, table, bed and bath linens and accessories in their factory in Anghiari, Tuscany. Fabrics are produced according to age old methods and, from dying to spinning and weaving, every production phase is executed in Italy. 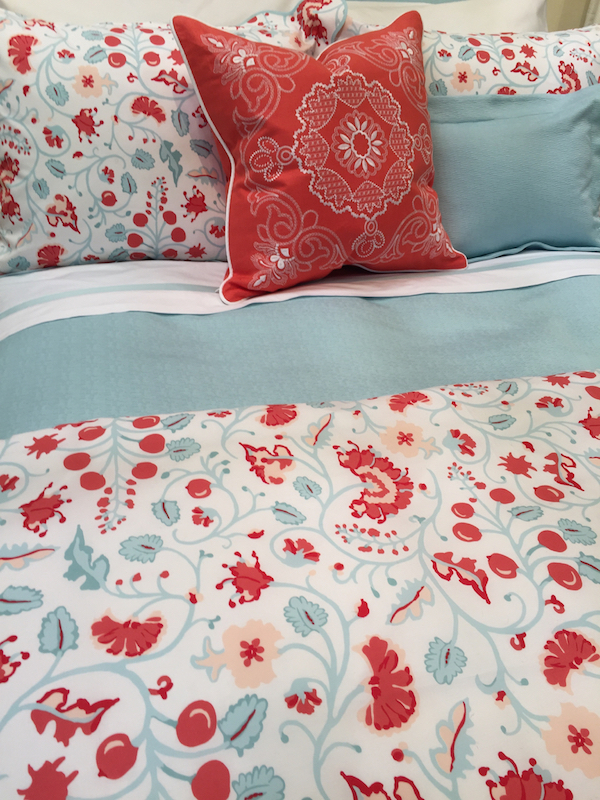 Matouk‘s new bedding from Lulu DK was so irresistible I ordered it for my older daughter. The tropical lagoon and coral combination is just what we’ve been looking for and can easily segue to a first apartment after graduation next year. 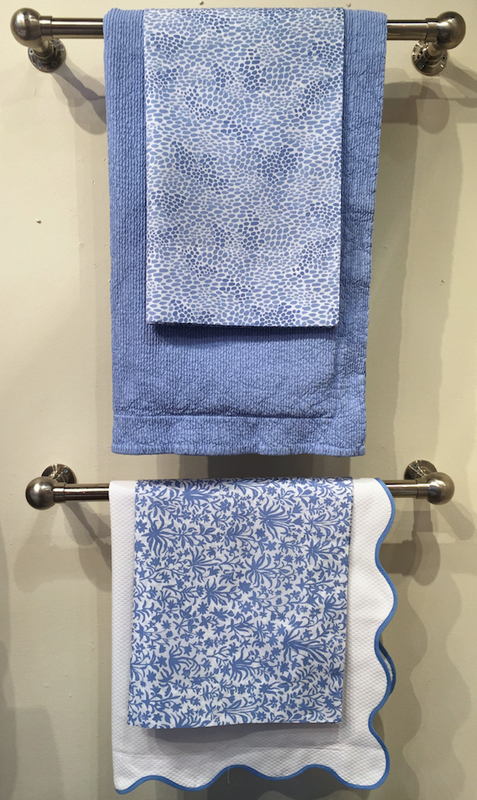 Blues in smaller patterns are perfect for a new look, mixing with existing linens or perhaps freshening up a summer beach house. 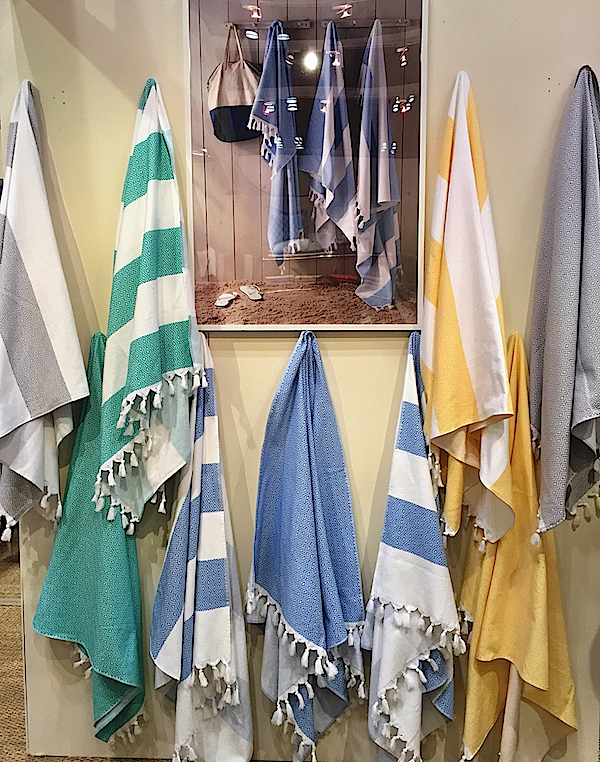 And while turkish towels were rather ubiquitous at the show, Matouk’s were particularly pretty and a great larger size. And in fragrances, two of my favorite brands were launching new scents. Nest‘s booth is always an elegant oasis. My pick was their new Cedar Leaf & Lavender, a marvelous melange of rosemary, lavender and sage enhanced with cedar leaves and a touch of eucalyptus. 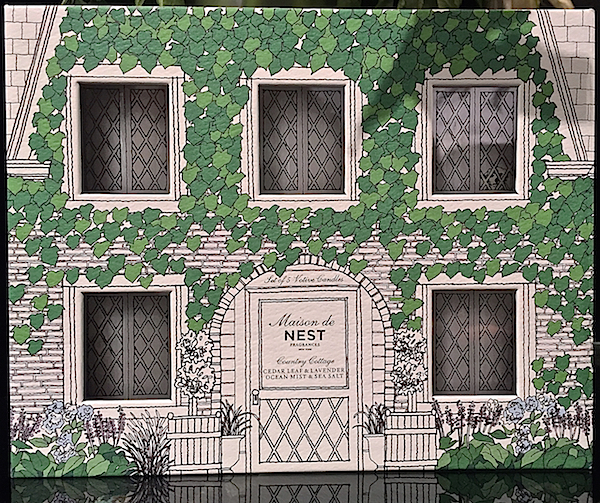 And for a special summer hostess present, keep in mind the charming Maison de Nest, Country Cottage gift set. 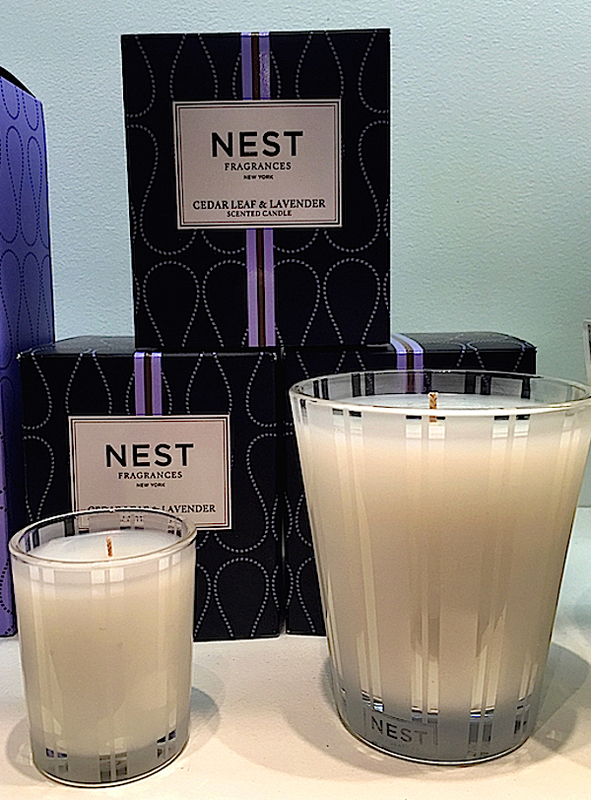 With five votive candles in two new fragrances, the fetching packaging is inspired by founder Laura Slatkin’s East Hampton home. 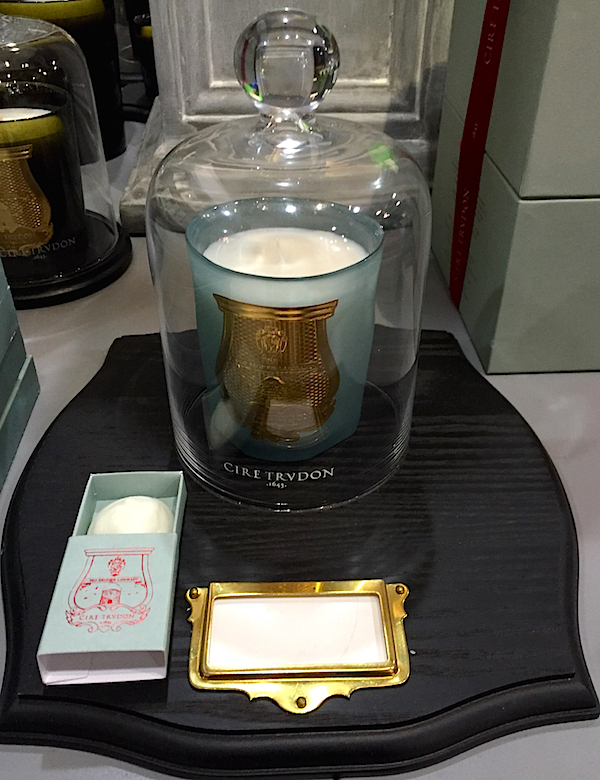 Historic French line Cire Trudon introduced a new candle in homage to Josephine, wife of Napoleon. In a beautiful muted duck egg blue glass, with signature gold foil seal, it is a sophisticated feminine scent. And continuing with their collaboration with illustrator Lawrence Mynott, they have added a new series of whimsical oversized matches. Wishing everyone a wonderful weekend and to those in the northeast, stay warm! 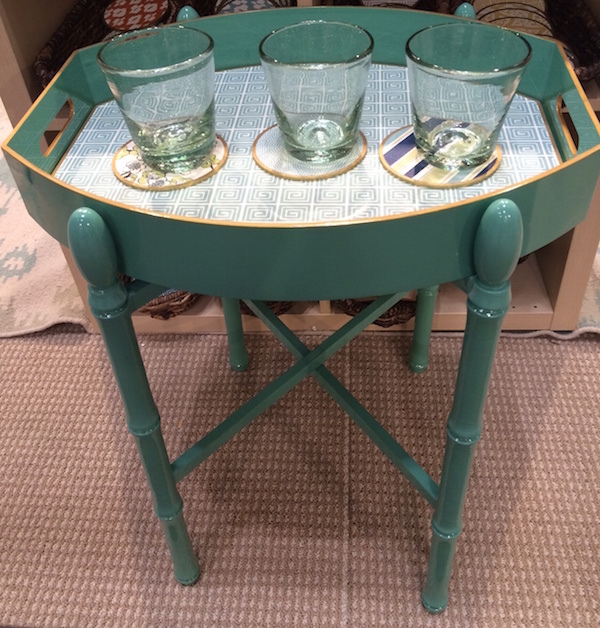 This entry posted in furniture, gifts, interior design. 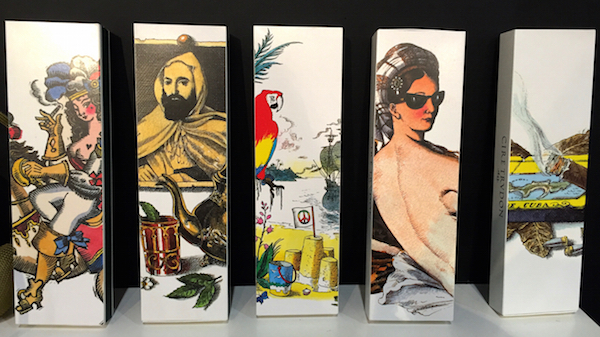 Entry Tags: decor, Gifts, Home, interior design, NY Now, NY Now 2015, Tabletop Bookmark the permalink. Love the post! It’s fun so see the pretty spring goods. Glad you are back up and running! I love the look of spring! These bright colors are making me especially joyful and even more excited for spring to come! I’m definitely digging the stripes for spring, as well as, the deep navy blues with varying hues of green. Great post! Stacey you have brightened my morning. I truly love everything! The tray tables are amazing!! Wait! I want two rolls of that Lee Jofa Hedges wallpaper and a handsome somebody to adorn my hall with it! 81 queries in 0.587 seconds.